Why, why you ask?! I thought Amy Burns the Recipe Book was all about plant-based adaptations of our favorite comfort foods. Ten days ago my boyfriend and I decided to go Paleo. I never thought in a million years I’d hop on this trendy diet train. After all, I’ve worked really hard over the last five years to reconsider my diet, adding greens, cutting out sugar, and reducing animal protein at every turn. I didn’t make the decision to cut wheat, dairy, grains, legumes, and alcohol out of my diet lightly, believe me! I made the decision to try Paleo because two of the people I love most in the world suffer from auto immune disorders. My Mom was diagnosed with rheumatoid arthritis almost 15 years ago. Since that time she’s been through hell battling one of the most severe cases of the disease doctors have ever seen. Up until a couple of years ago, diet wasn’t even addressed in the conversation about chronic illness. Doctors have written my mom countless prescriptions for a myriad of symptoms, but not one of them has come even close to treating her holistically. Not one of them have made her whole. And so we’ve waited impatiently, tried everything, while crossing our fingers for some new information to change the game. My active involvement in my mom’s disease started almost ten years ago. I worked with a woman who also had rheumatoid arthritis, and like my mom, she was bedridden and crippled with pain…until she adopted a vegan diet. I looked for books or articles online that addressed the possible nexus between diet and auto immune disorders. Not one existed. Now, as so many of us and our loved ones have become fed up with traditional medicine’s tendency to treat just our symptoms and not its root cause, new resources are finally available to address chronic illness. Currently, I’m crackin’ the spines of The Autoimmune Solution, by Dr. Amy Meyer and The Disease Delusion by Dr. Jeffrey Bland. Both advocate treating a whole host of maladies from fatigue, migraines, obesity, acne, joint pain, and depression with food. Food. Not pills. Specifically, both books call for the elimination of gluten and dairy. And that’s what has brought me to the Paleo diet. Already pretty healthy, I’m adopting the diet for a couple of reasons: A) solidarity with my loved one’s who are giving it a whirl as a desperate attempt to finally manage their diseases, and B) to see if some of my minor health and diet complaints can be remedied by giving up (for 30 days) some of the things I love most in the world (dark chocolate, cheese, and red wine, in that order). This recipe is a welcome departure from the hunk of meat and sweet potato meal characteristic of the Paleo diet. I love ethnic food. I’m all about injera, curries, spicy noodle dishes; you get the gist. This stir fry substitutes rice, prohibited in the Paleo model, with a surprisingly delicious cauliflower puree. 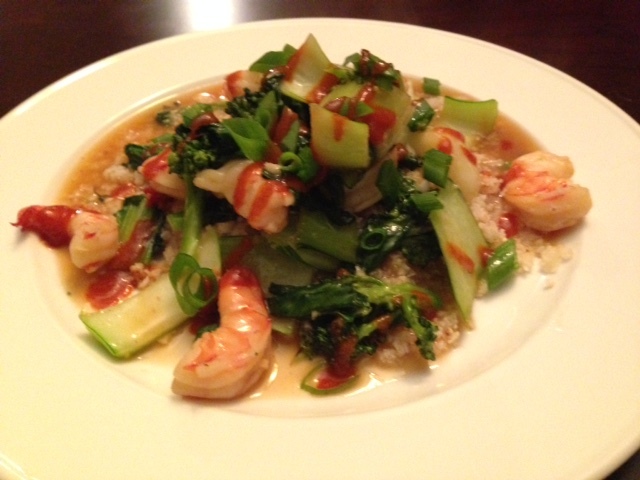 It’s packed with green veggies, protein from the shrimp, and the sriracha and ginger give it a great kick. I’ll keep you all updated on the new diet as the month goes on. Send a good word to the heavens that I’ll be able to continue avoiding His vast bounty. Chop the cauliflower down into 1-inch pieces and process in a food processor or blender until the mixture resembles rice-size pieces. You’ll want to process the cauliflower in four batches to ensure an even puree. 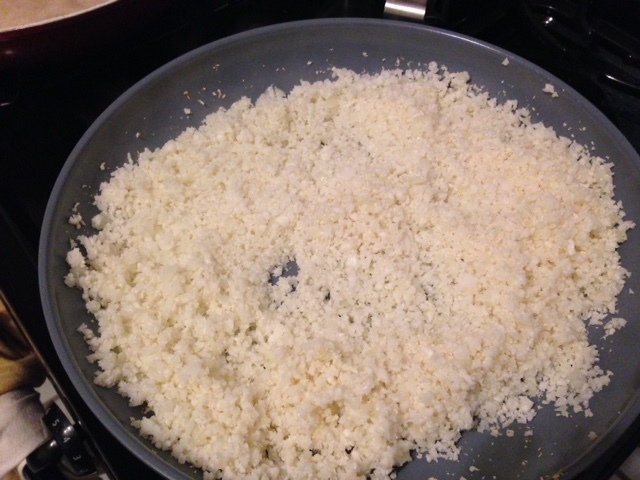 Move the cauliflower rice to a large non-stick saute pan and combine with the oil, onions, and garlic. Cook the cauliflower on medium heat until it appears slightly dry and some pieces are starting to turn golden, stirring periodically for 10-15 minutes. While the cauliflower is cooking start the sauce by sautéing the ginger and garlic in a small stock pot with the sesame oil. Cook on low heat until fragrant, about 2 minutes. Add the rest of the ingredients and incorporate with a whisk. Bring to a boil and then return to a simmer for 5-7 minutes. Heat a large non-stick saute pan on medium high. Add the coconut oil and the broccoli. Saute for 2 minutes until the broccoli is slightly browned and starting to become tender. Add the boy choy and stir until incorporated. Let cook about a minute, and then add the shrimp. 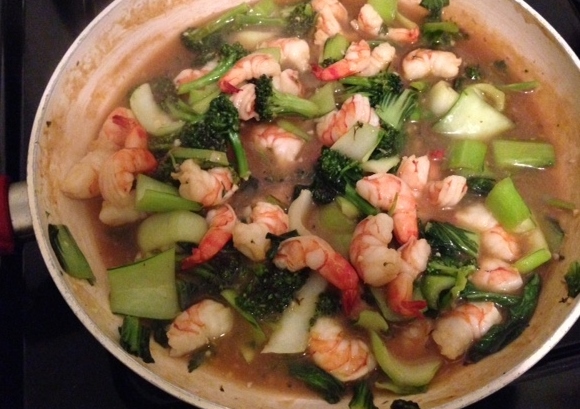 Toss the shrimp with the rest of the ingredients until they just barely turn pink, about 2-3 minutes. Pour the sauce over the stir fry and stir to incorporate. Let all of the ingredients simmer together for another minute or two. 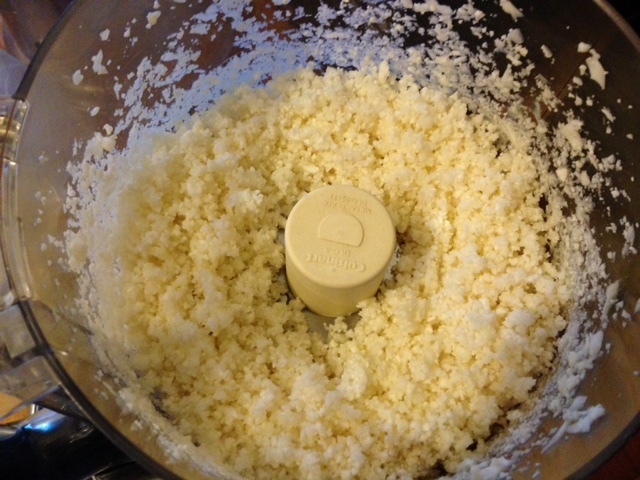 To serve, scoop the cauliflower rice into a bowl and top with stir fry mixture and sauce. 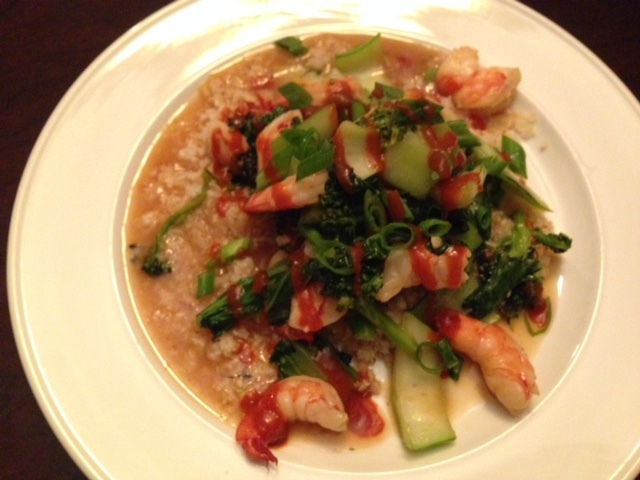 Top with chopped green onion and additional sriracha.